Whether it’s doing our bit for charity, searching out the latest products and services, staying focused on our next award or just making sure we are taking care of our planet. There is always something keeping us busy here at TNS. We could not be happier to announce that we won a Viva Award… for the fourth time! Thanks to our devoted clients, TNS have been awarded ‘Favourite Nail Salon’ for the Viva Beauty Awards 2016! A big thank you to each and every person that voted, we appreciate your support and here’s to more future wins! 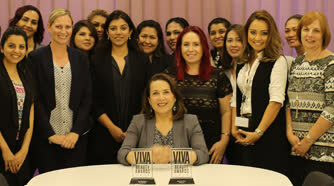 VIVA is the best-selling women’s glossy in the GCC. Aimed at the new generation of reader — offering a diverse mix of features and fashion every month. artbar, TNS’ newly launched concept unveils its first artist collaboration! 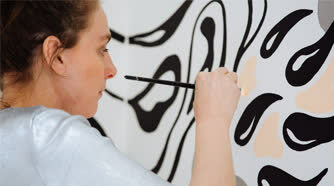 As a platform for creative collaborations with artists, designers and brands artbar chose their first collaboration with Berlin-based Parisian artist Gambette, also the creator of alfa.k paris nail stickers, in the form of a wall-mural that surrounds artbar from three sides, immersing artbar clients in Gambette’s abstract forms and fluid lines. See it at TNS Jumeriah Beach Road and take a look at the artist in action here. 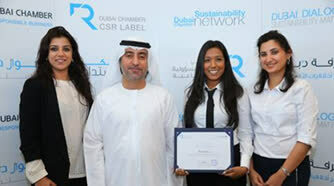 We proud to announce that TNS has been awarded the CSR Label award for another year running! It is the fourth time TNS has won the award which recognizes our companies achievements in corporate and social responsibility from The Dubai Chamber of Commerce who honored 20 companies in total with the label this year. We celebrated the opening of our Jumeirah Road spa in association with Harper’s Bazaar Arabia. 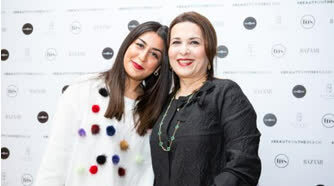 The fun-filled launch party saw Dubai’s socialites and fashionistas party the night away with Tala Samman setting the vibe for the evening in the DJ booth, while Zahra Lyla and other VIP guests sipped on mocktails and delved into canapes by No. 57 Cafe. 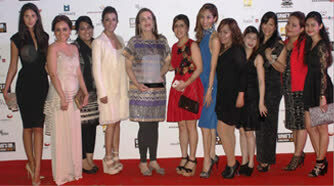 The occasion marked TNS’ eleventh spa across the UAE. 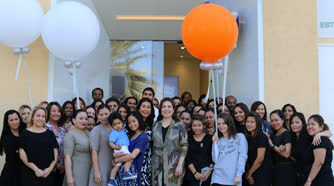 Our new spa on Jumeirah Beach Road is now open, after months of hard work and dedication from our fabulous team! 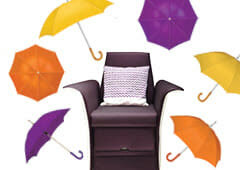 Take a seat in one of our 8 pedicure stations or 3 manicure stations for all your TNS favourites. Get creative and play, create and curate at the artbar, our innovation lab for nail design or relax in one of our two new treatment rooms for total body bliss. With new features such as iPads for your mani and pedi chairs, perfectly picked products from new beauty and skincare brands and over 300 polishes from Essie, OPI, Inglot and Kure Bazaar we hope you won’t want to leave! 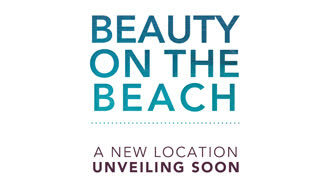 Marking thirteen years since The Nail Spa first launched in the UAE, we’re proud to announce the unveiling of our newest flagship, coming soon to Jumeirah Beach Road, Dubai in December 2015.Jumeriah Beach Road will house our existing homegrown beauty brands, The Nail Spa and Marquee bringing our total portfolio to fifteen locations across the UAE . Jumeirah Beach Road will reveal a r t b a r, an exciting new nail art concept! With inspiration from contemporary art and fashion, a r t b a r will offer nail design as an extension of style and a platform for self-expression and creativity. 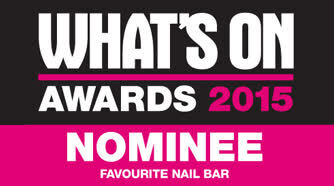 TNS IS YOUR ‘FAVOURITE NAIL BAR’ IN DUBAI AT THE WHAT’S ON AWARDS 2015! We did it! We’re honored to take home the What’s On Dubai Award 2015 for ‘Favourite Nail Bar’ for the very first time! Our perfectly polished award is sitting pretty at our beauty base camp and we could not have done it without you – our wonderful clients that support and love us each and every day. A big thank you to each and every person that voted and here’s to more future wins! What’s On is the UAE’s best-selling entertainment magazine – celebrating the best in hospitality, entertainment and leisure. This October we’re going pink to launch our #checkyourself campaign in collaboration with Pink Caravan, a UAE breast cancer awareness charity initiated by Friends of Cancer Patients. As part of the campaign, each client can make a difference by donating AED 5 to their transaction or purchasing a pink ribbon of which 100% of the proceeds will go towards supporting the charity. TNS will continue to support Pink Caravan’s Riding for Courage initiative supported by Royal Patrons His Highness Dr. Sheikh Sultan Bin Mohammed Al Qasimi and Her Highness Sheikha Jawaher Bin Mohammed Al Qasimi throughout October.